My cousin asked how to make the Hiragana script (one of the Japanese scripts) available on Ubuntu because the script is available on Gwibber but not available system-wide. She noted that it was Katakana that is available system-wide. Romanized Japanese is called Romaji. Romanized Chinese is called Pinyin. "Romaji is to Japanese as Pinyin is to Chinese"
1. Accessing the Language Support window. 1.1. In the Launcher, see Pic 1, click the Dash Home icon, see Pic 2. Pic 1 - Refer to Step 1.1. Accessing the Language Support window. Pic 2 - Refer to Step 1.1. The Dash Home icon in the Launcher. 1.2. In the Search field, type-in "language", see Pic 1. 1.3. Click the Language Support icon, see Pic 3. The Language Support window will appear, see Pic 4. Pic 3 - Refer to Step 1.3. The Language Support icon. 2. Step 2 to Step 4 is to install the packages for the language. In the Language Support window, under the Language tab, click the Install/Remove Languages... button, see Pic 4,. 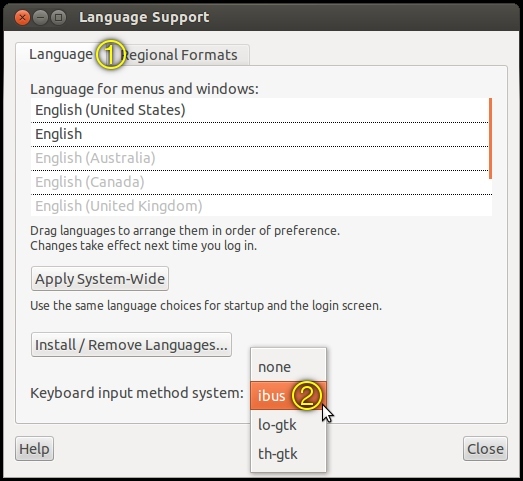 The Installed Languages window will appear, see Pic 5. Pic 4 - Refer to Step 2. The Language Support window. 3. In the Installed Languages window, see Pic 5, search for the Japanese language. Put a tick in the box under the Installed column for the Japanese language. Then click the Apply Changes button. Pic 5 - Refer to Step 3. The Installed Languages window. 4. The Authenticate window, see Pic 6, will appear to ask for your password. Key-in you password in the Password field. Then click the Authenticate button. The Applying changes window, see Pic 7, will appear to show the progress. Allow some time for the process. Pic 6 - Refer to Step 4. The Authenticate window. Pic 7 - Refer to Step 4. The Applying changes window. 5. Step 5 to Step 9 is to setup the input method. Then the Language Support window can be closed. Pic 8 - Refer to Step 5. Setting the keyboard input method system. 6. Setting up the input method. 6.1. In the Launcher, see Pic 9, click the Dash Home icon, see Pic 2. Pic 9 - Refer to Step 6.1. Accessing the IBus Preferences window. 6.2. In the Search field, type-in "ibus", see Pic 9. 6.3. Click the Keyboard Input Methods icon, see Pic 10. Pic 10 - Refer to Step 6.3. The Keyboard Input Methods icon. Keyboard Input Methods (IBus Daemon) has not been started. Do you want to start it now? The IBus icon, see Pic 12, will appear in the Panel. Pic 11 - Refer to Step 7. Nameless window-1. Pic 12 - Refer to Step 7. The IBus icon which appears in the Panel. Note that the Keyboard Layout icon has nothing to do with the IBus icon. IBus has been started! If you can not use IBus, please open System Menu -> System Settings -> Language Support and set the "Keyboard Input Method" to "ibus", then log out and back in again. Pic 13 - Refer to Step 8. Nameless window-2. 9. The IBus Preferences window, see Pic 14, will appear. Go to the Input Method tab. From the Select an input method menu, choose Japanese > Anthy. Pic 14 - Refer to Step 9. Adding the input method. 10. Giving Hiragana a try. Open LibreOffice Writer or any other program. Click the IBus icon in the Panel, see Pic 15. In the menu, change from Input method Off to Japanese - Anthy then type-away. To write, you type in romaji, e.g. nihongo. As you type, that would be replaced by hirigana にほんご. Hit space and that would be replaced with the kanji 日本語. Hit space again and you get a menu of other ways to represent it, which is important as Japanese has many homonyms. When you're done, remember to change the input method back to Input method Off. Pic 15 - Refer to Step 10. Changing the input method. 11. If the input method is giving you trouble, try restarting the application automatically by choosing Restart from the menu, see Pic 15. If the problem persists, simply Quit the application, see Pic 15, and restart it manually, see Step 12. 12. Next time, to start the application, in the Launcher, see Pic 9, click the Dash Home icon, see Pic 2. In the Search field, type-in "ibus". Click the IBus icon, see Pic 16. Pic 16 - Refer to Step 12. The IBus icon. I don't think the Pinyin input in my system came with the Japanese language package shown in Step 3 to Step 4. i think it came with some other packages that were installed in the previous version of Ubuntu. Pic 17 - The added input methods. 13. If you need to add Pinyin, repeat Step 3 to add the package. Search for the Chinese (simplified) language package see, Pic 18. Pic 18 - Refer to Step 13. Adding the language package. 14. Repeat Step 9 to add the input method. In the IBus Preferences window, see Pic 17, go to the Input Method tab. In the Select an input method menu, add Chinese > Pinyin.